I always wondered how LinkedIn could make money, but now I know, although it is probably not quite what the owners were thinking of….Congratulations to those canny US class action lawyers who have made claims on behalf of LinkedIn users who sent invitations to others to become a connection. There is now another category to add to PPI, mis-sold packaged bank accounts and other claims you never even knew you had! It has agreed to pay $13 million to compensate the users signed in on its “Add Connections” features. 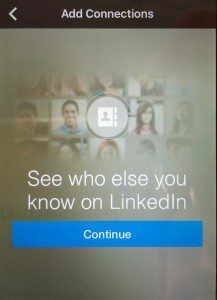 The “Add Connections” feature allowed LinkedIn to import your contacts from external email accounts and then send invitation to your entire address book. The multiple messages would remind your friend, colleagues or acquaintances that you want them to be part of your “personal network”. If a connection invitation was not accepted within a certain period of time, up to two “reminder emails” were sent reminding the recipients that the connection invitation is pending. I have experienced something similar with Whatsapp, so will they be paying me too? “Specifically, the second and third endorsement emails could injure users’ reputations by allowing contacts to think that the users are the types of people who spam their contacts or are unable to take the hint that their contacts do not want to join their LinkedIn network,” Who would want to be thought of like that? As a result LinkedIn chose to pay rather than fight in court. People who used “add connections” between September 17, 2011 and October 31 2014 are eligible. Those eligible can claim up to $1,500, though it will likely be less (as little as $10). If the final sum of any of the claimants results in an individual pay-out of less than $10, LinkedIn has agreed to add an additional $750,000 to the overall fund. Claims must be filed before December 14, 2015, and there will be a final approval hearing on February 11, 2016. You will also be submitting to the jurisdiction of the California Court. Hey Presto! 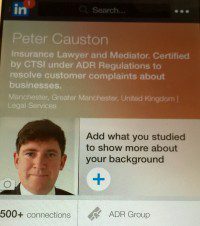 With over 500 connections on LinkedIn, I am now an international complainant! Please let me know if you received an invite to connect with me that led you to think worse of me than you already did, as this will be good evidence for me, or have you ever found one of my posts or emails about the ADR Directive irritating and annoying? It does seem to me that this could be the thin end of the wedge! For example, people find the anonymous viewers rather annoying. Could it be argued that this is also a breach of privacy? What about fellow travellers included in holiday snaps uploaded to TripAdvisor? What about fake reviews on Trip Advisor? Food for thought. It is not the first time that LinkedIn has hit the headlines, for example recently we had the issue raised by a barrister who highlighted that professionals are using the site like some kind of tinder dating service, with unwelcome attention from users, one of whom complimented her on her photo, saying “you definitely win the prize for the best Linkedin profile I have ever seen”. Without wishing to enter the controversy, someone linkedin with me said about my photo “I have seen more handsome photos of you.” Should I take offence? Should there be some organisation to determine disputes between social media users and to order redress? There is some good advice about using LinkedIn here: http://fortune.com/2015/01/27/8-ways-to-better-market-yourself-on-linkedin-in-2015/ or how not to look like an idiot.